Advent's ultraportable is definitely half the price of the MacBook Air it apes, but is it half the quality? While the popularity of the netbook has continued unabated, a new market has grown in the form of Consumer Ultra Low Voltage (CULV) laptops. Combining ample mobility with greater power than a netbook, the Advent Altro is the latest to hit the market. Despite taking huge design cues from Apple's MacBook Air, the 1.7kg Altro is slightly heavier, costs almost half the price and uses resilient silver plastics rather than aluminium to keep costs down. The main body is sturdy enough for semi-regular travel use, but we noticed some flex when typing. The thin screen panel is less resilient, bending easily under pressure. The hinges are particularly weak, requiring plenty of care when travelling. The keyboard continues the Apple styling, with black keys cut through individual holes in the silver chassis. Usability is excellent, and all the keys move firmly and with little noise. The large touchpad also mirrors Apple's design, even featuring gesture-control functionality. The quality of the 13.3-inch screen is average. It's not the brightest panel we've seen, but images are sharp and colour and contrast are adequate. The glossy Super-TFT coating increases reflections, but we found it posed no significant problems when working on the move. 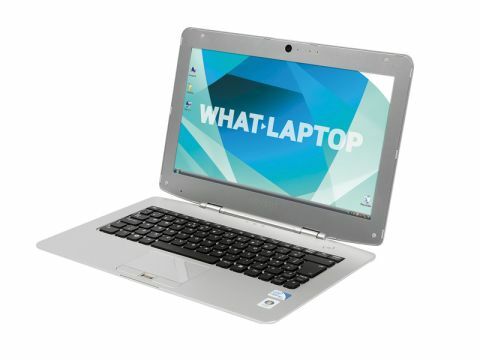 Rather than the low-powered Intel Atom processors seen in the majority of netbooks currently available, the Altro uses an Intel Celeron chip. With a TDP (Thermal Design Power) rating of just 10 Watts, this low-voltage CPU runs smoothly within the slimline, 25mm-deep chassis. Performance cannot rival a full-sized laptop, however, and the Altro is sluggish to respond when multi-tasking. It also gets uncomfortably warm at the rear. For word processing and browsing the internet, it is more than capable, however. When working away from the office, we were able to keep working for 178 minutes under battery power. While this falls short of the three-hour minimum we commonly see from even the most basic, entry-level laptop, this is still a suitable result for use on the daily commute. 802.11n Wi-Fi provides high-speed wireless connectivity. The inclusion of just one USB port is unfortunate, but is not a complete surprise on a chassis this thin. A compact hub is included however, and increases connectivity, with VGA-out, two USB ports and an Ethernet port. While the Advent Altro can't match the stunning quality of the MacBook Air or other more expensive ultraportables, its low price and great usability make it a good choice for those needing comfortable mobility and more power than a netbook. Well worth a look.